Come on, Baby, Cover Me! We’ve been sitting on this cover art for months! When Pip Ballantine and I first saw it, we were over the moon. Imagine the heartbreak when our editor, Diana Gill, told us “You can’t post this anywhere just yet.” To watch the evolution of this cover, from the earlier drafts to the final product, has been a real trip; and while this is my fifth novel, it feels like my first. The rest came from the creative minds of Harper Voyager (formerly Eos Books). You know that blogpost I keep promising, both here and on my Facebook group? Well, a fire has been lit under my bottom with the arrival of these cover flats. Somewhere during line edits (yes, I go on and say it — between the lines…), I’ll be going into my thoughts and feelings on this steampunk project, and how Eliza and Wellington will be affecting Rafe, Askana, and Billi. It’s not bad news, rest assured. It’s just a very different direction for myself as a writer. I think the important bit to walk away with from this post is that in May 2011, I step back to where my heart has always been: Fiction. Thanking Laurie McLean (my agent) and Diana Gill seems so inadequate, but I do appreciate this opportunity that they have given me. Laurie could have easily passed on this idea Pip and I hatched over Skype one night, but she saw the potential and got behind the book. Diana, with everything on her desk, not only saw the potential but really got behind the book in the negotiations; and in our discussions and her notes, she gave us her time and expertise and made the story even better. Thank you, both. And thank you, Pip. She was pretty much set with Geist and Spectyr. She knows my cold feet when it comes to collaborations. She pressed, and she inspired me. Pip got me writing fiction again, and with our current preliminary work on Of Cogs & Corsets, it feels great. Who knew my Muse had a New Zealand accent? I really am blessed to have you in my life. So, one step closer, here we are — a book cover for my first mass market paperback, coming to a book store near you in May. If you want to find out more about what we have planned in the ways of blog tours, appearances, and accompanying podcast, pay us a visit at The Ministry of Peculiar Occurrences. May your weekend be full of that steampunk funk. Cheers! Am I allowed to drool? Great cover! I’m so excited for you Tee. This will be a great experience I’m sure. Can’t wait to own a copy! Best of luck to you and Pip in this and all your future collaborations. First thing that went through my head when I saw the artwork link posted in Twitter was “Ooh! 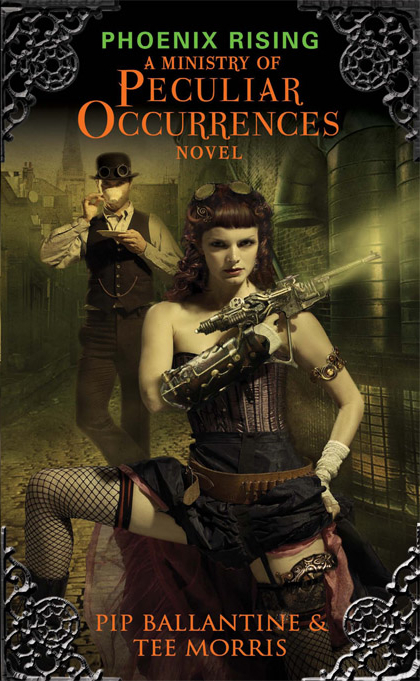 ‘The Avengers’ in Steampunk!” I am SO looking forward to this! So glad you could finally release this! Any chance you might be able to show some of the evolution of the cover? It sounds like it might be an interesting view into the publishing process. Really looking forward to the chance to read this one. Not that I wouldn’t like to see more from Rafe, Askana, and Billi, but I love what I’ve seen of these characters so far. Hoping that May outstrips all expectations with boatloads of WIN. Not sure how much I can share in the evolution of the cover, but at con appearances I can always go into that, sure. Fair enough. I understand not being able to share secrets that aren’t exactly yours. Just think it would be cool to see. Totally not what I was expecting! I love it! Eliza…Yes. Just yes is all I can say to this. Corsets, Fishnets, and steampunk gear? I’m in! I don’t know where I’ve been, but that is pretty sweet, bro.